In Attack of the Clones Obi-Wan seeks the advice of Master Yoda in finding a missing planet. During this time Yoda is teaching a group of younglings. One of them is a Togruta of unknown gender who looks similar to Ahsoka Tano. Is it ever acknowleged in canon that this is her, or is it another of her species? This was addressed by Lucasfilm's Leland Chee. Q. Are Ashla and Ahsoka the same character? LC: No. The ages don't match up. And since she gets a name in the Databank, they can't possibly be the same person. Native to the planet Shili, the Togruta are notable for their striped, horn-like montrals and head-tails. The species has spread beyond their homeworld to colonies such as Kiros, which was despoiled by Zygerrian slavers during the Clone Wars. 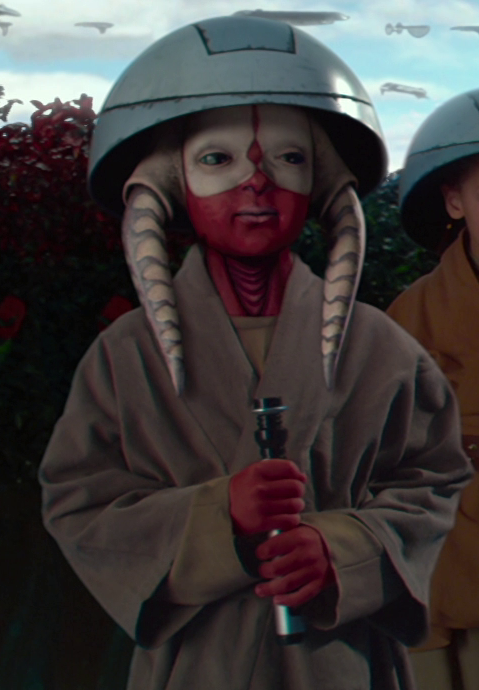 Notable Togruta include Governor Roshti of Kiros and three members of the Jedi Order: Ashla, a youngling; the Jedi Master Shaak Ti; and Anakin Skywalker’s Padawan, Ahsoka Tano. Not the answer you're looking for? Browse other questions tagged star-wars attack-of-the-clones or ask your own question. Why didn't Ahsoka assist the Rebellion after Order 66? Is there a test or trial to become a padawan? Did Master Yoda Guess that Palpatine was Evil before Anakin turned? Was Anakin ever better than Yoda with the lightsaber? Why wasn't Obi-Wan surprised or amused by meeting a new species in Attack of the Clones?